Definition: The bus whose voltage and frequency remains constant even after the variation in the load is known as the infinite bus. The alternators operating in parallel in a power system is the example of the infinite bus. The on and off of any of the alternator will not affect the working of the power system. The voltage and frequency always remain constant. The synchronous impedance of the bus is low because of parallel operations of the machine. The performance of the synchronous machine varies on the infinite bus. When the synchronous machine operates independently, variation in their excitation causes the changes in their terminal voltage. The power factor of the synchronous machine depends only on their load. But when the synchronous machines are operating in parallel, the change in their excitation changes the power factor of the load. 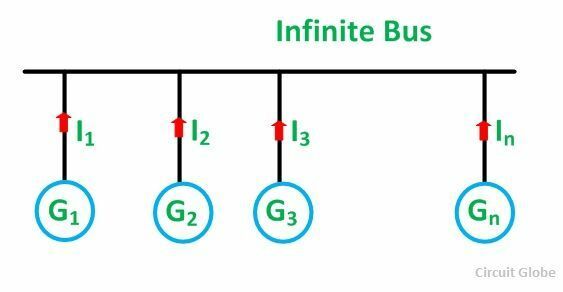 Consider generators G1, G2, G3……Gn connected to an infinite bus as shown in the figure below. If the value of n is very large, nJ is also very large. Therefore, acceleration → 0 and the speed is constant. The above equation shows that the constant voltage and frequency of the bus depend on the number of machines operating parallel.